When the Toyota Prius debuted a decade-and-a-half ago, it revolutionized the automotive industry with its fuel-efficient and eco-friendly design. Consumers flocked to the Prius in droves and many other automakers attempted to the replicate the Prius' success with their own hybrid offerings. Not one to rest on its laurels, Toyota went to great lengths to ensure that the appeal of 2016 Prius would extend well beyond the car's proven environmental credentials: the new model also boasts a stylish, attractive design in keeping with its fun-to-drive nature. 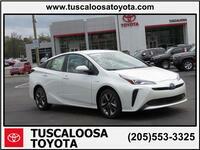 And if you're looking for the 2016 Toyota Prius in Tuscaloosa AL, then you'll be delighted to know that the latest generation of this iconic hybrid can be found right here at Tuscaloosa Toyota. The 2016 Prius also has elevated its level of performance to match its new athletic styling. To greatly improve core vehicle performance, Toyota is implementing the Toyota New Global Architecture program, and the new Prius and its entirely new platform is the first global product of this activity. This has resulted in improved handling, safety and heightened driving enjoyment. Nearly every aspect of the new Prius has been improved in surprising and significant ways. And it certainly shows once you get behind the wheel of the 2016 Prius, for with such updates as a new suspension and increased chassis rigidity, drivers get to enjoy a dynamic and exciting driving experience. The 2016 Prius possesses a spacious and refined interior than enables everyone to stretch out in comfort. It also boasts many high-tech features, including the outstanding Entune App Suite, JBL Audio, Navigation and Bluetooth connectivity and USB port. The time-tested Hybrid Synergy Drive system on the 2016 Prius combines the benefits of an efficient gasoline engine and a clean, quiet electric motor. It can be powered by the engine, the electric motor or a combination of both, and will automatically choose the most efficient mode for the best mpg. Toyota's engineers have effectively blueprinted the revised engine to the finest limits and tolerances, making the 2016 Prius more efficient than ever. With a combined fuel economy of 55 mpg, you'll be spending more time seeing the sights instead of the gas pump on your next vacation. The new 2016 Prius received a thorough overall both inside and out, and from the bold design to the high-quality interior, the Prius has never had such a powerful presence. The new model inherits the nameplate's signature triangular silhouette which, combined with a low center of gravity, results in an impressively angular yet emotional design. Flowing curves blend with aggressive cut edges that spark interest from any angle. The top of the roof has been lowered by 20 mm and moved forwards, while the engine hood has also been lowered to create a stylish outline. Despite all of the changes on the 2016 Prius, the improvements have been achieved with no sacrifice to interior space. A major attraction of the Prius is its exceptional fuel economy, and with the 2016 Prius, Toyota's engineers have redesigned its hybrid powertrain to achieve an ever greater increase in fuel-efficiency. Almost every internal component of the Prius engine is new or substantially revised, resulting in an over 40% thermal efficiency and a huge boost in fuel economy. For an outstanding level of driving enjoyment and fewer trips to the gas station, come check out the 2016 Toyota Prius at Tuscaloosa Toyota today. Also, be sure to check out our no-cost non-factory Lifetime Warranty, which extends the standard Powertrain Warranty for any new Toyota model.